Today I would like to take the opportunity to write about inverse square law. 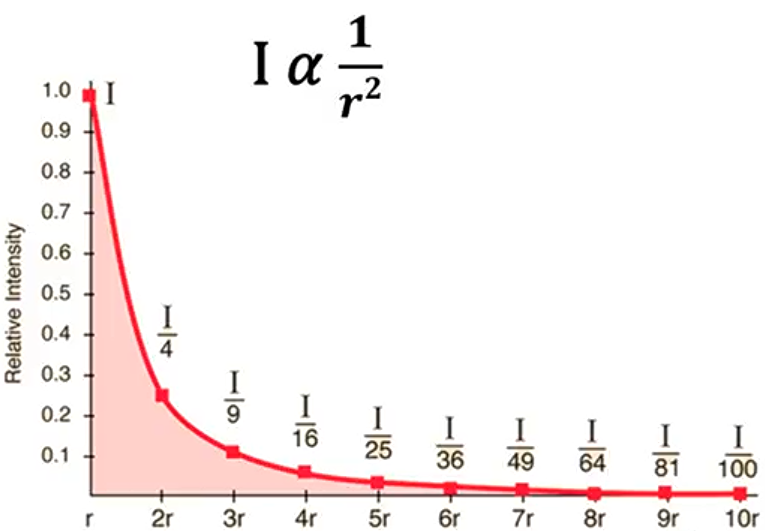 What is inverse square law and why it’s important for us as Wi-Fi Engineers to understand. Its important to understand that how RF behaves when distance increases. 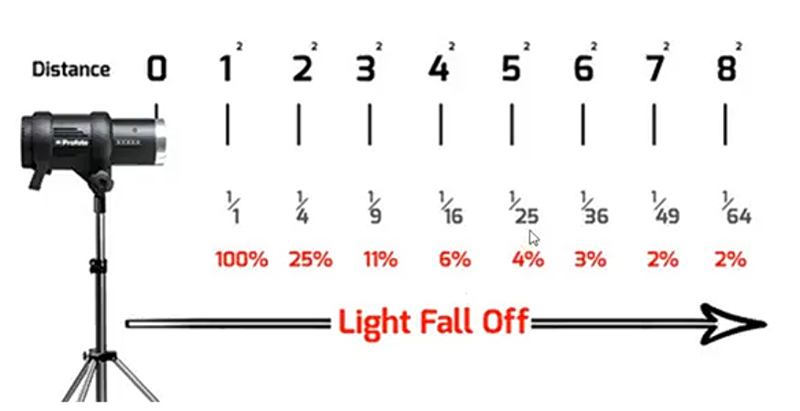 I will start with light example which is easy to understand, and it work same way as RF. Characteristics of the light is when it comes out of the source the intensity will start decreasing very fast. Let’s suppose we place a light bulb or say antenna in WLAN scenario and want to test intensity of signal or light on the one cell of the football highlighted in yellow. Area of football (Square) 4 π r2. if you want to measure the intensity of the light on the square of the football where area of the sphere is 4pi square. Formula to measure intensity i= s/4pi r square. From the formula we can understand that if radius will increase intensity will decrease. Let’s suppose radius is 1 intensity is 1 but if radius is 2 intensity is quarter ¼. So, if you go away from the source 3 times then intensity will drop by 1/9. 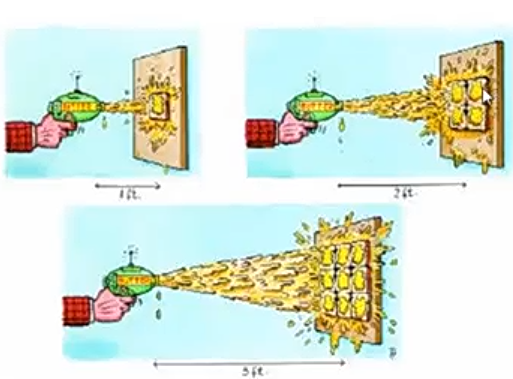 Same affect can be seen the example below where light is focusing towards eggs from a source and by changing the distance the intensity of the light decreases gradually. So, if keep going away from the source intensity will drop dramatically. If radius is 1 then intensity 100% and if you go double the distance, then intensity will drop to 25% and will keep dropping. Now we look at butter gun example, we shoot with butter on the toast from 1 foot or meter and it fill the toast with butter. Now if we double the distance, we can see that radius will increase with same amount of butter on 4 toasts but layer off the butter will be much less than the half of the distance. This does not only apply to visible light but happens to entire electromagnetic spectrum. Radio wave micro wave, infrared all holds inverse square law. It’s as simple as that. What we haven’t discussed in depth is the relationship between distance and the received power of RF waves, which is also simple, but less intuitive. Once you understand just how dramatically distance impacts reception, you’ll be fighting for every inch. As radio waves travel outward from their source – a transmitter – they lose intensity, and fast. The intensity of radio waves over distance obeys the inverse-square law, which states that intensity is inversely proportional to the square of the distance from a source. Think of it this way: double the distance, and you get four times less power. This works the other way around, too, and is crucial to the point we’re trying to get across here: halve distance, and received power is increased four times over. So, while you can’t always have the freedom to move a receiver as close as you want, shortening the distance by just a few inches can counter intuitively produce dramatically better signal, because of the inverse-square relationship. Though intensity drops very fast still radio waves can travel far which can cause ACI and CCI. Only way to reduce ACI and CCI by using correct design, location, antennas types and power. Note: On the topic of intensity lets talk about 2.4Ghz vs 5Ghz. We often hear that 5Ghz travel less then 2.4Ghz ? is it really true? I am afraid its not. 5Ghz will travel same distance as 2.4Ghz. Today you fire 2.4Ghz and 5Ghz in vacuum towards mars and both will reach there. Difference is wavelength of both frequencies. 5Ghz is has smaller wave length which means it will have less intensity or impact on the receiver (antenna) which feel less energy as compare to 2.4Ghz. On other hand 2.4Ghz has bigger wave length and it will have greater intensity as compare to 5Ghz and receiver will feel greater intensity or impact which means better signal strength as compare to 5Ghz which is due to impact of the wave on receiver. Also because 5Ghz has shorter wave length it has to travel greater distance through attenuation objects and decrease intensity quicker then 2.4Ghz as shown below.